I’ve been so busy doing pre-Printsource show coverage and getting all of my work together that I’ve scarcely shown you anything new of my own! So here’s one of my favorite print vignettes I designed for the show. 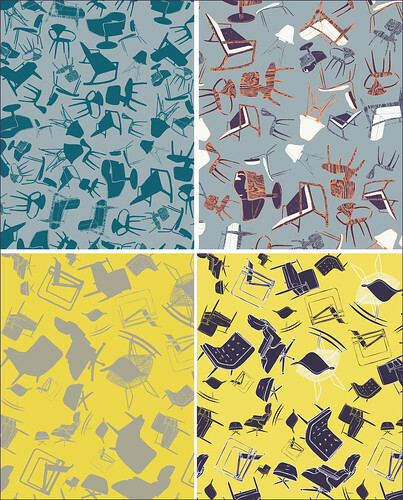 To start, I drew loads of midcentury chairs (I do love them) and then played around with various colorways and ideas and repeats. I’d like to have the first one above printed up by Spoonflower and then upholster a chair with it (my husband won’t be thrilled if I get another chair). How meta would that be though? Wish me luck, I set up the show on Monday. I will be posting regularly through the week….hopefully I’ll have the time to snap shots of my booth E8 and say hi to Peagreen and the other folks I covered here on Maquette. I hope you have a lovely summer weekend full of fireflies, picnics, swimming, and lounging. I plan to do a little lounging before summer’s out. I just love these prints!! You could make a pillow for your Eames rocking chair (I’d place a hefty bet that you have one or two). Good luck for the show, although you don’t need it, your prints are genius. Most important, have tons of FUN! thank you so much…I do need the luck….so I’ll take your well wishes!! Thanks so much! Actually I don’t have an Eames rocking chair….oh how I wish I did!!!!! I have a danish modern style chair that I’ve posted because I had it upholstered with my own fabric print. I have a bertoia at my desk, a knoll at the head of the dining table, and a Miller at my drawing table. I neeeeeeeeed a rocking chair!!!!! A friend of mine in college stole a slew of Eames lab chairs from a geology lab building. I could never have done that!!! I scavenge for chairs at flea markets….there’s just no room in our apartment for more right now. When we have the baby in Oct. we will move to another apt in the hood. I would love to get a kid’s rocking chair, wouldn’t that be cool!? ps: i wish I had a eames rocker too! we’ll have to scout Brooklyn Flea! This is marvelous! It’s going to be a hit at Printsource. How neat! I love them.